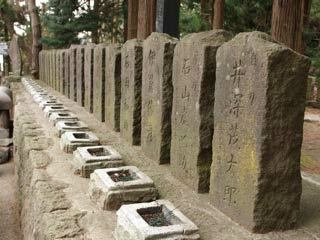 The graves of Byakko-tai (白虎隊の墓) is one of the most visited spots in Aizu-Wakamatsu. It is located in the middle of Mt. Iinuma. Byakko-tai is Samurai unit consisted of 16 to 17 years old in Boshin War in 1868. The story of Byakko-Tai is one of the biggest tragedy happened in that War. Today, there are about 2 million visitors in this place. There is a payed escalator. Byakko-tai is Samurai unit consisted of 16 to 17 years old in Boshin War in 1868. Byakko-Tai was assembled as a reserved defense unit in the Battle of Aizu. In Boshin War, Aizu was the last resistance for new government. So, they they decide to attack and defeat the Aizu domain. Because Aizu lost many samurai at previous battles, they need all people to join the war. The sons of samurai who were age of 16 to 17 assemble as Byakko-Tai. Byakko-Tai joined the battle of Aizu, and protected the entrance of Aizu. The castle was already surrounded by the new government army. They realized that whatever they did, they would lose and captured as the prisoners. They decided to do Seppuku because as the proud Aizu Samurai, being war prisoners and losing the proud of Aizu were unacceptable. Iinuma Sadakichi one of Byakko-tai members, survived and told the tragedy of Byakko-tai, later. He was the only surviver of Byakko-Tai. Sadakichi told all the tragedy of Byakko-Tai later. The location where Byakko-Tai did Seppuku. You can see entire area of Aizu field and Wakamatsu Castle.